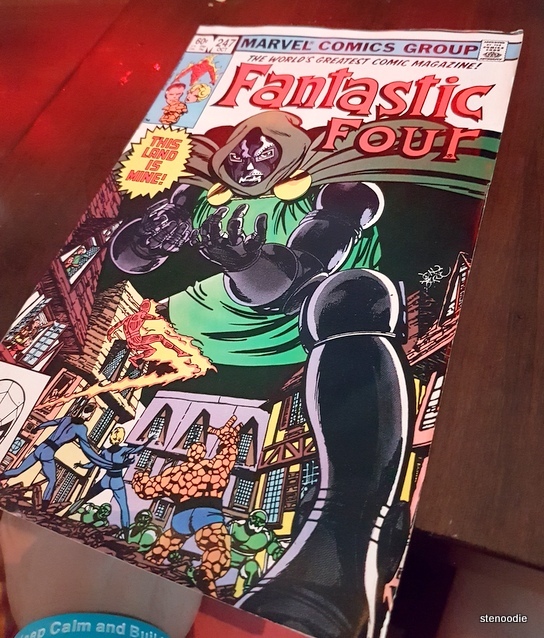 I recall when BlogTO posted an article about the opening of this unique restaurant called Figures in which comic books were the theme and there was even an “secret entrance” in order to enter the restaurant. 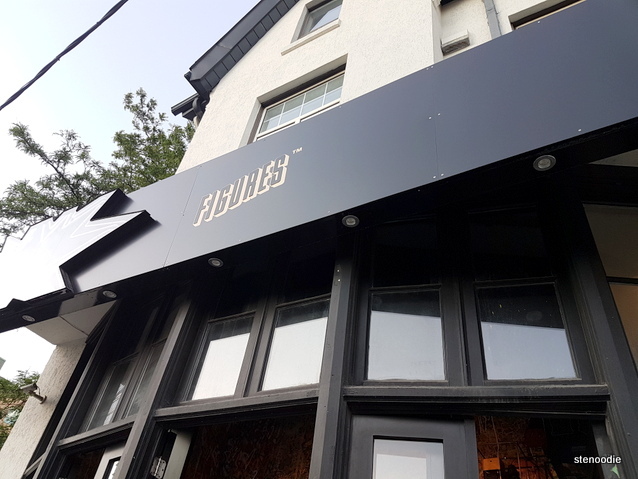 Well, my friends and I visited the restaurant last Saturday evening and I have to say I was really disappointed (and felt a little jipped) about the entire experience. 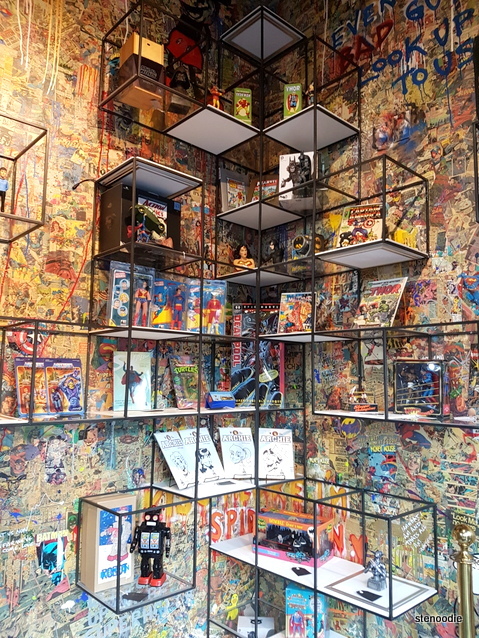 When Raymond first asked me about joining the crew for dinner at Figures, I was eager to join in to see what the hype about this comic book themed restaurant was about. I went on their website and I was intrigued about their website because it was a “movable” collage of comic book characters. When I tried to click the “menu” category to view the menu however, nothing responded or showed up. I was thinking maybe there was a hidden tiny spot in order to click to see the menu or maybe their menu is secret and hidden purposely from customers. Anyway, our reservation was made for a Saturday evening at 5:45 p.m. 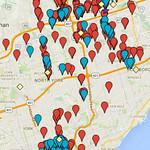 Figures is located near Yorkville in downtown Toronto (although not directly in the heart of Yorkville; it’s on Avenue Road) and thus was part of a more posher area than other neighbourhoods. 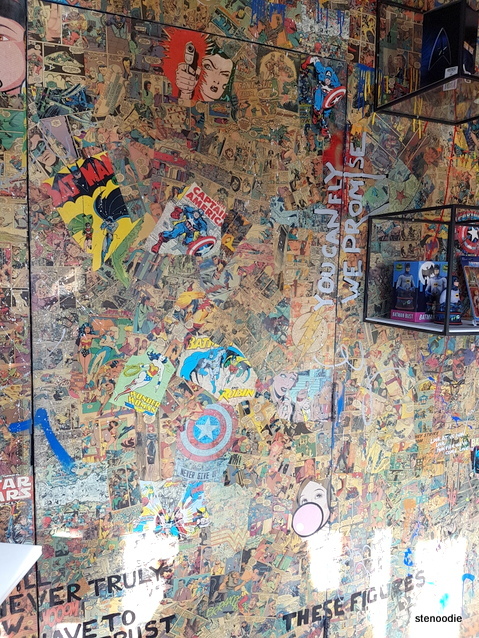 I found it interesting that this was the location for a comic book themed restaurant — something that didn’t seem to match with the other shops? 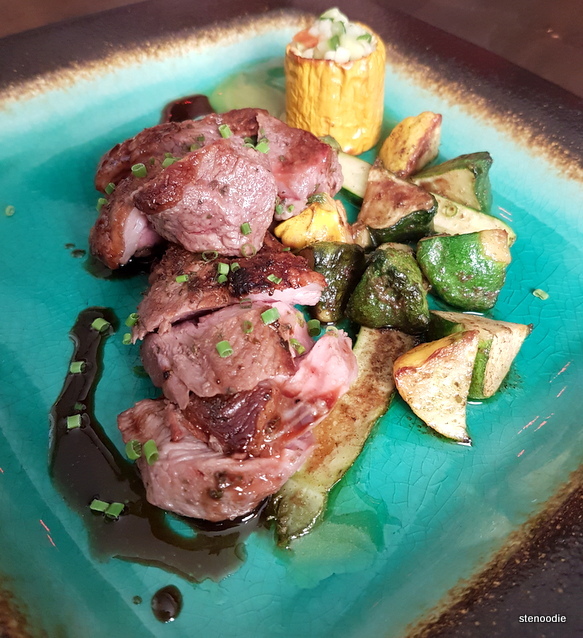 When we approached the hostess and I informed her about the booking, she found out it was our first time to the restaurant and gave us a brief introduction about the restaurant. Once we were inside, we weren’t allowed to take photos of the mural wall but that everything else was okay. 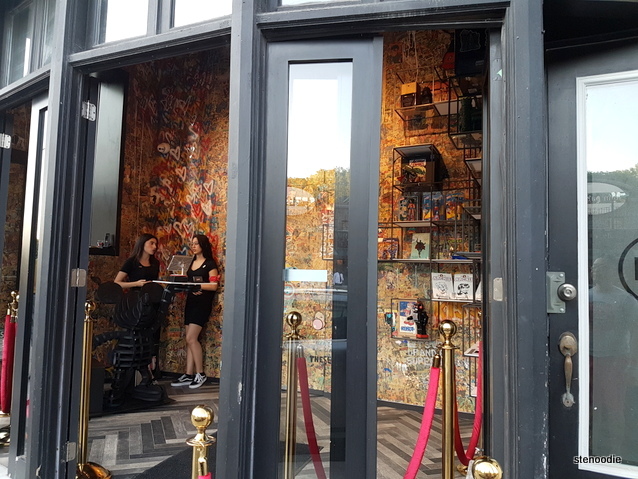 Then, she directed me to press a button in the design of Captain America’s shield and the hidden door (camouflaged by comic book figures) opened to reveal the restaurant itself. This was really cool! The area where the hostess’s table was also acted as a vintage toy store where there was a shelf with items for sale. The hostess led us to our table where three of our friends had already arrived. They had already ordered some cocktails off of the drinks menu. One look at the drinks menu told me that the price point for this restaurant was going to be high. 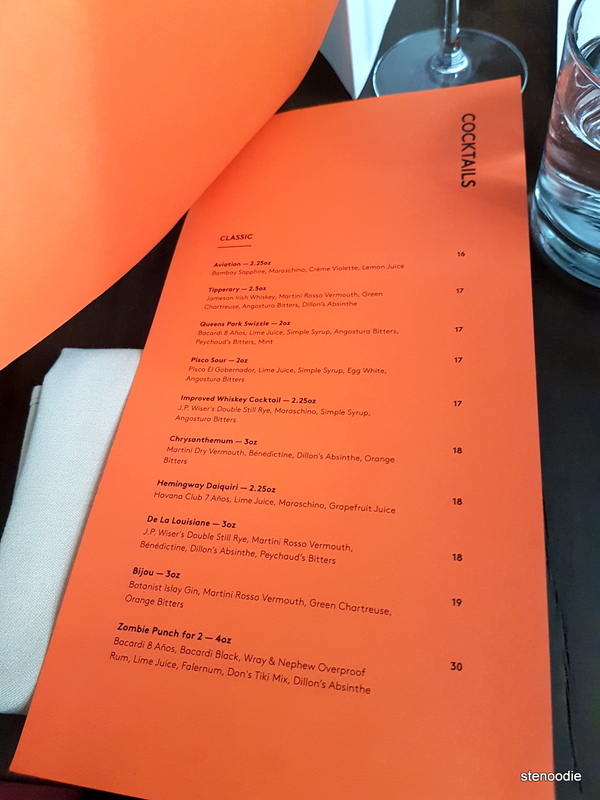 The cheapest cocktail was $16 and ranged all the way to $30, the most expensive one. Only a few of the drinks had some relevance to comic books. Ken decided to order the “Web Slinging Spider Hombre” since its name sounded like it might be uniquely themed. 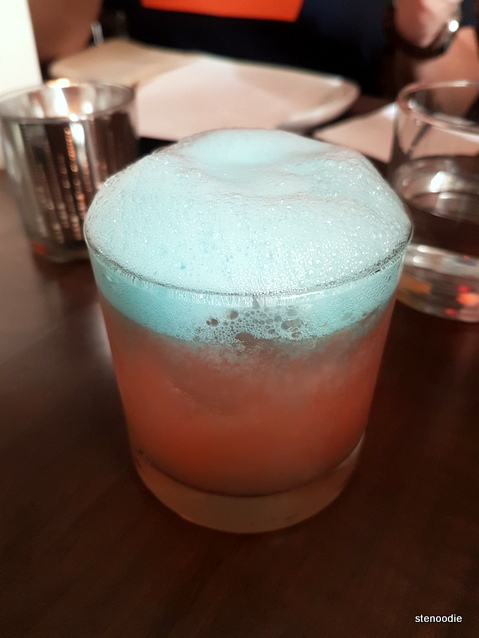 This had Ciroc, St. Germain, Aperol, Berry Cordial, Lemon, and Blue Curaçao Air. 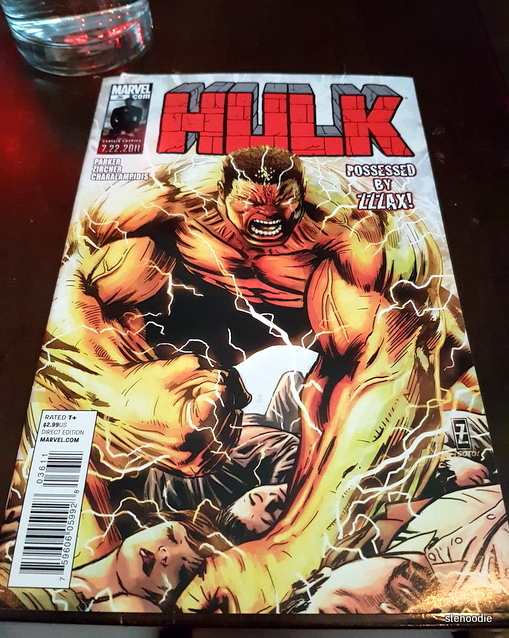 When it arrived, it had some blue foam at the top but no comic book figures (are my expectations too high?! Lol). Taste-wise, it was a little sour but did taste good. I thought that it was a very good drink for pre-eating because the sourness opened up the appetite for food. 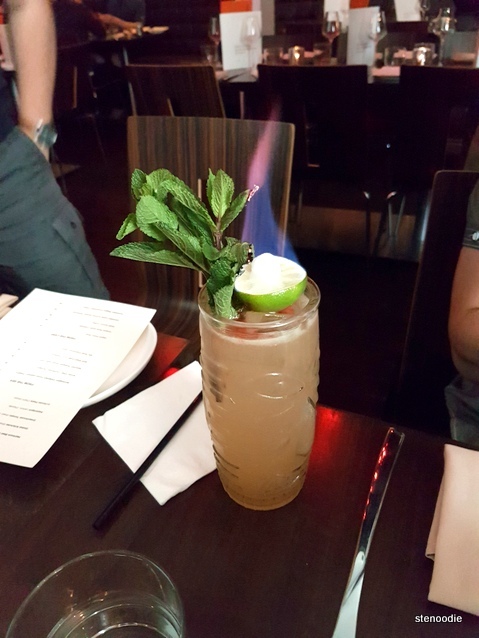 Here is the photo of the “Rarely on Target” cocktail that Anh ordered. 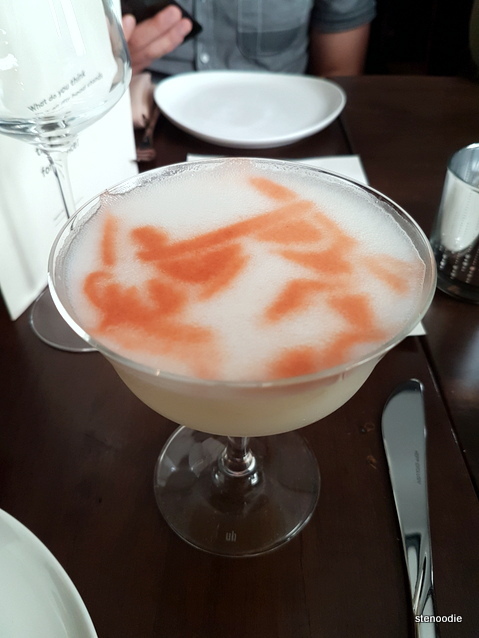 It had Bacardi Maestro, Dillon’s Absinthe, Egg White, Lime, Pineapple Cordial, Orgeat, and Coconut Milk. It had the outline of a Stormtrooper on it! I thought it was quite neat. Once everyone had arrived and we discussed what we were going to order, we placed our order with the server. Their menu was separated into three categories: “From the earth”, “from the sea”, and “from the land”. This reminded me of Thoroughbred Food & Drink and how their menu was arranged in the same fashion. 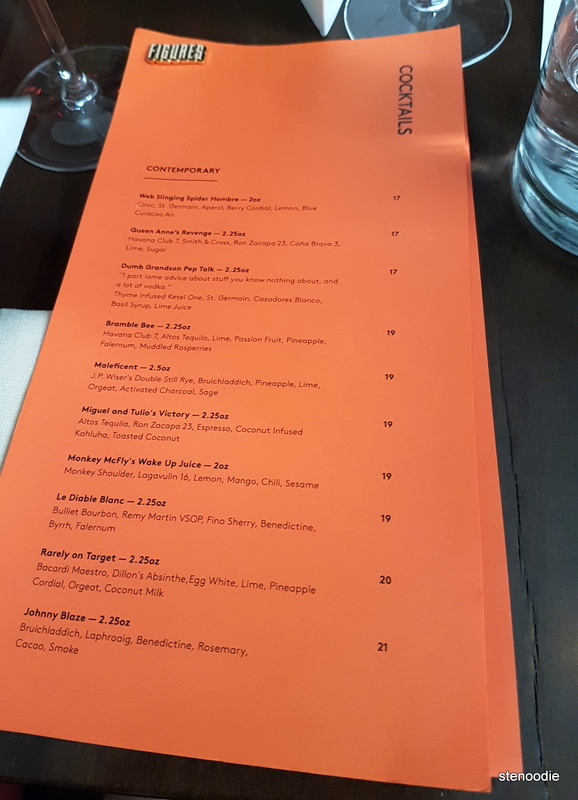 Again, the menu items were quite pricey when portioned individually and the server did inform us before we ordered that it was going to be more of a tapas style dinner where the dishes were in small portions and designed to be shared. 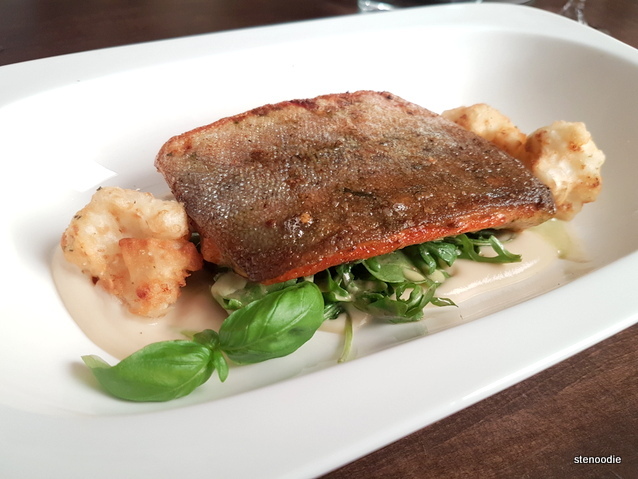 We as foodies were definitely okay with sharing; we love sharing dishes so that we can try more on the menu. However, since each menu item was priced at the steep end, we also didn’t want to over-order and break the bank (lol). 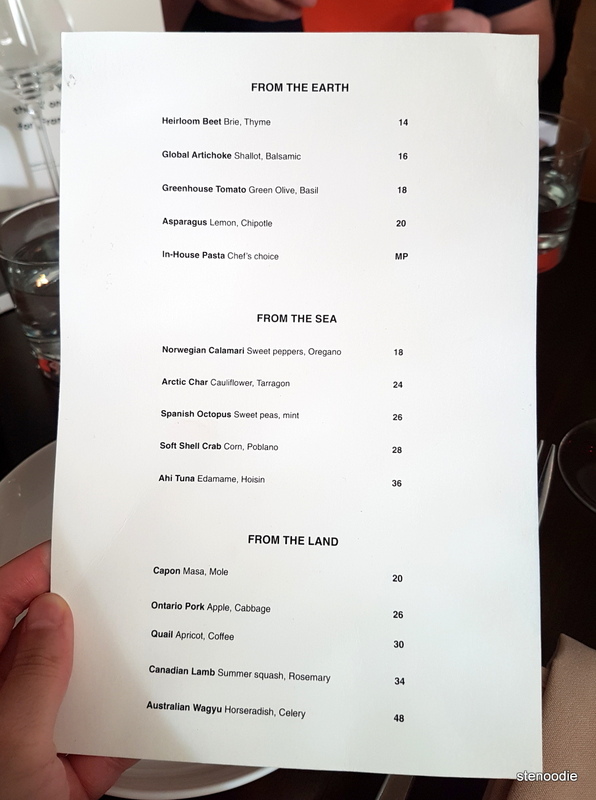 We decided on the 1) Artichoke, In-House Pasta (gnocchi that day), 2) Arctic Char, Octopus, Soft Shell Crab, and 3) Lamb and Quail. When we placed our order, the server informed us that these weren’t going to be enough for the seven of us and that it would be better if we picked two more. Hmm… to me, it sounded more like a firm insistence on the extra items rather than a polite recommendation. Nevertheless, we gave in and did order one more dish and added the Calamari. 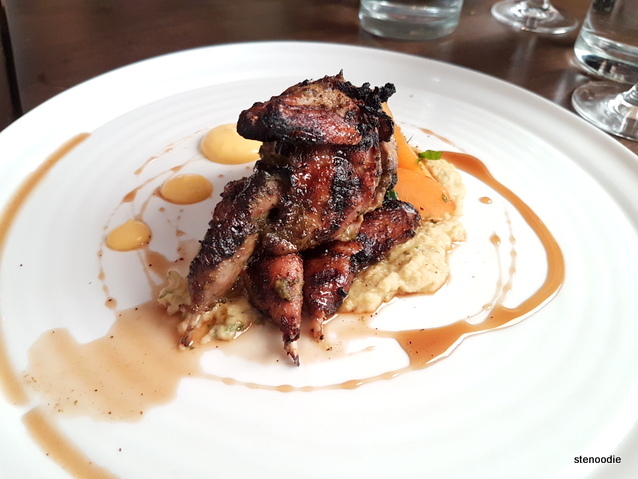 The server again insisted that we needed one more item, like an extra Quail perhaps. But we resisted and said we were fine and would order more afterwards if needed. Thank goodness we resisted. The first four dishes arrived together for the first round. 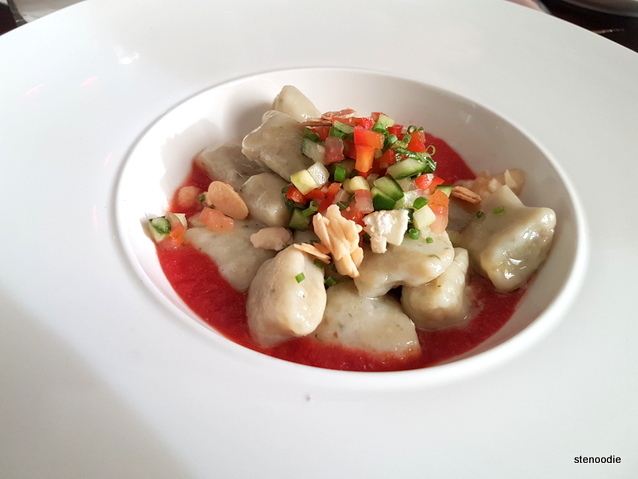 This was the Global Artichoke, In-House Gnocchi, Norwegian Calamari, and Spanish Octopu. Two servers brought our food to the table at the same time and they thoroughly explained what the dishes were for us. 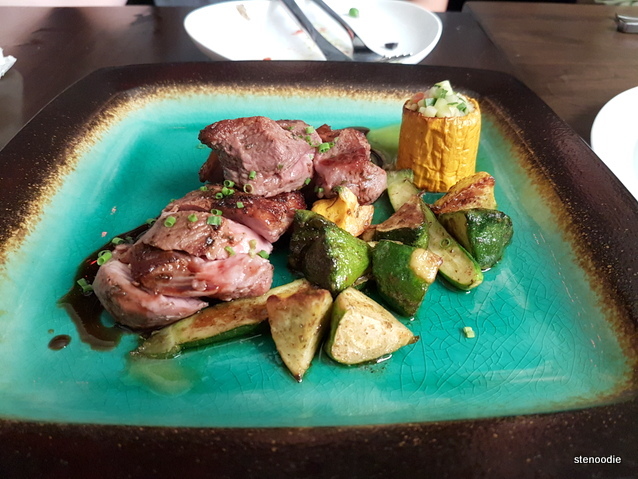 I’m not good at describing food where there are a lot of small components (it doesn’t help that the menu doesn’t show all the ingredients in detail either, so the food blogging from this point on might be a bit vague). The Global Artichoke had shallots and balsamic. There was a jelly on the side with a character imprinted on it. (Boo, what is the character called again? XD). Overall, this dish was all right. The artichoke was really huge though. I liked the puréed part of it more than the actual artichoke. The In-House Gnocchi was all right. It was soft but could have been more pillow-y. I also thought that the crunchy vegetables on top of it didn’t go well with the gnocchi. 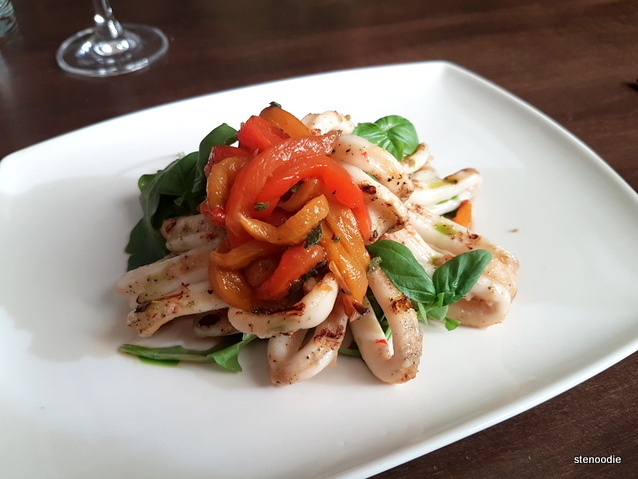 The Norwegian Calamari had sweet peppers and oregano. Wow, I really enjoyed this dish! The calamari was so flavourful and perfectly cooked; it wasn’t firm or rubbery at all. Yummy! I liked the look of the sweet peas and mint sauce though. However, I thought that the sweet peas weren’t fresh and tasted very mushy (like the frozen peas kind…). After our first round was done, we waited a little bit before our second round arrived. 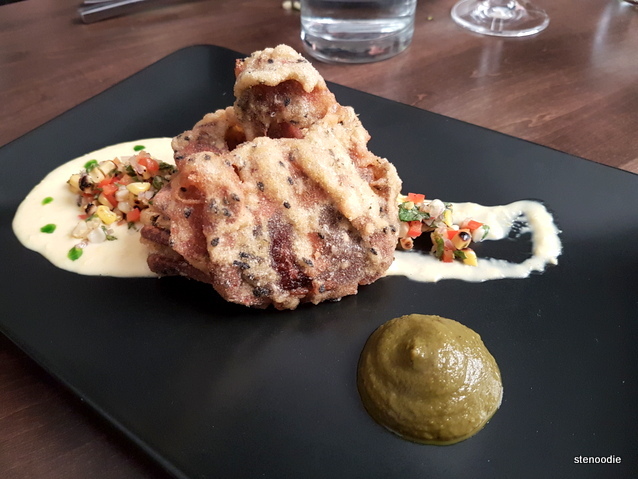 The Soft Shell Crab was a little disappointing. I love soft shell crab in general. This came with corn and poblano which I thought didn’t match well with the fried crab at all. 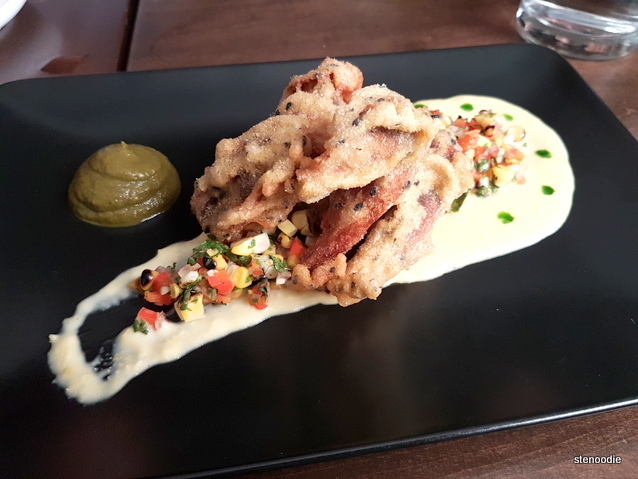 This dish was difficult to share too because once the initial crispy shell part of the soft shell crab had been cracked and divided up, the leftover pieces on the table were mostly dampened. 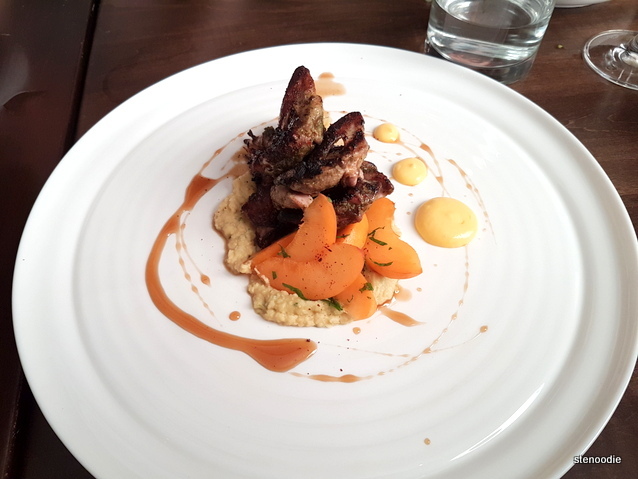 The Quail came with apricot slices and coffee cream. The quail meat was all right. Quails are very small birds and thus there wasn’t much meat to share (no wonder the server recommended two quails for our table — but seriously, $30 for a quail dish?). The apricot slices were very fresh! Looks gorgeous and this one tasted good too — but again, for $34?!?!? 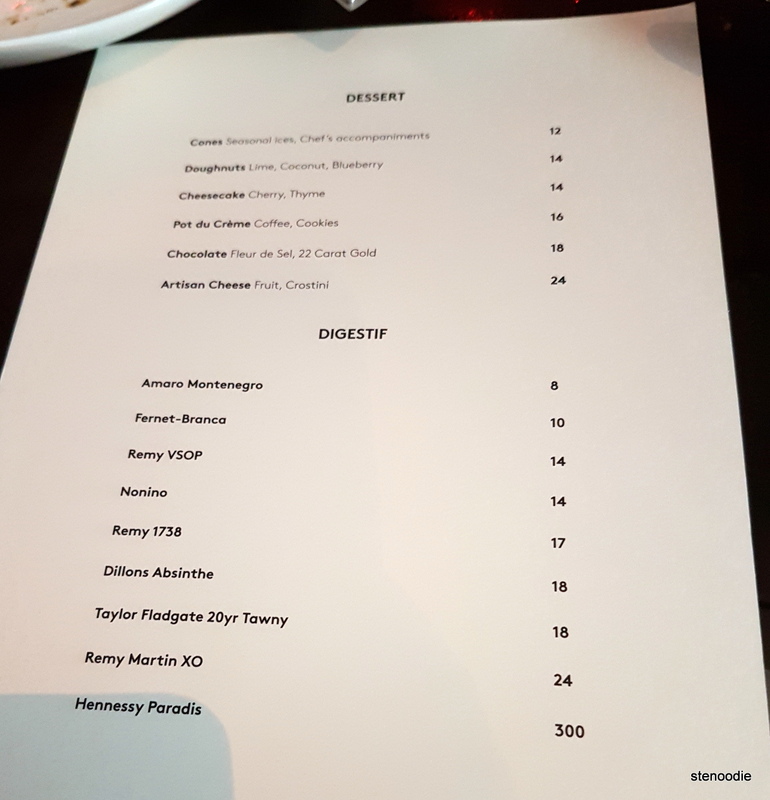 We asked for the dessert menu to consider our options but ultimately decided against ordering any dessert because our bills were already inflated too much. For the amount of money that we spent on the bill, we really only got a couple of bites in (I recognize that we were a table of seven and didn’t order the number of “recommended dishes” to share but still I thought the prices were very inflated and the portions were small). We actually decided to go to a pizza parlour right after the dinner to fill up the rest of our stomach space too (Pi Co to be blogged tomorrow!). 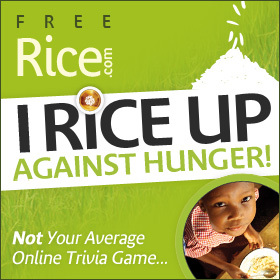 I left the restaurant having gained insight into what Figures was all about but definitely felt disappointed and jipped. 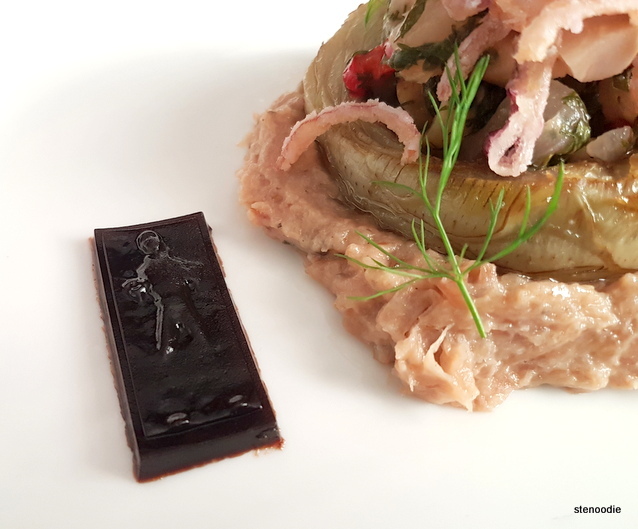 Only one dish had any visual allusion to a (comic book) character and the rest were all just fine dining dishes where not everything tasted great either. Some ingredients were great and some not so good. In other words, the dishes weren’t consistent in their tastes. 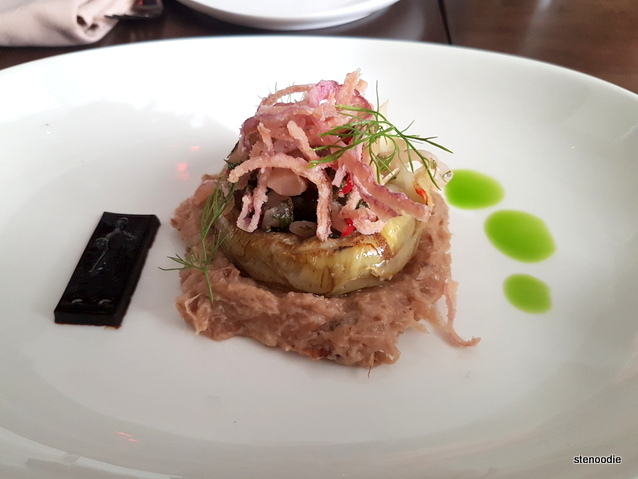 Unless you have the money to blow on tiny tapa dishes and really want to come here for the hype, I would suggest trying another restaurant instead. 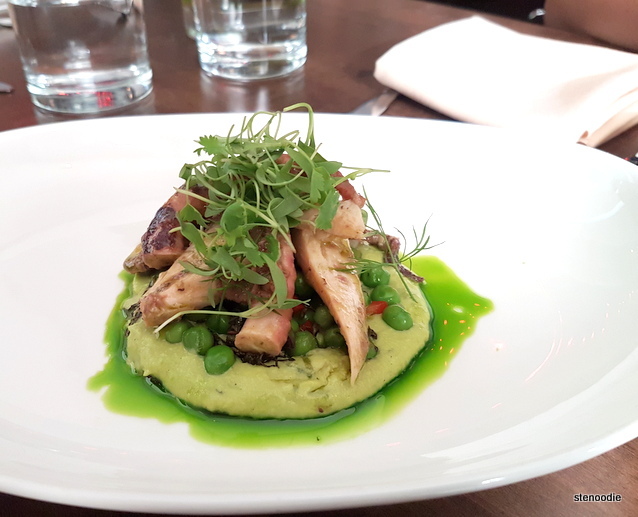 This entry was posted in Food and tagged 137 Avenue Rd, @figurestoronto twitter, Arctic Char, Canadian Lamb, comic book restaurant Toronto, family style sharing, Figures, Figures cocktails menu and prices, Figures comic book restaurant, Figures dessert menu, Figures dinner menu and prices, Figures is it worth the hype, Figures menu, Figures restaurant Toronto, Figures secret entrance way, Figures Toronto, Figures Toronto menu, Figures Toronto review, Figures vintage toy store, food blog, foodie, Global Artichoke, In-House Gnocchi, Norwegian Calamari, Quail, Rarely on Target, restaurant review, soft shell crab, Spanish Octopus, tapas, Toronto, Toronto food blogger, Toronto's comic book themed restaurant, Web Slinging Spider Hombre, Zombie Punch for 2. Bookmark the permalink.